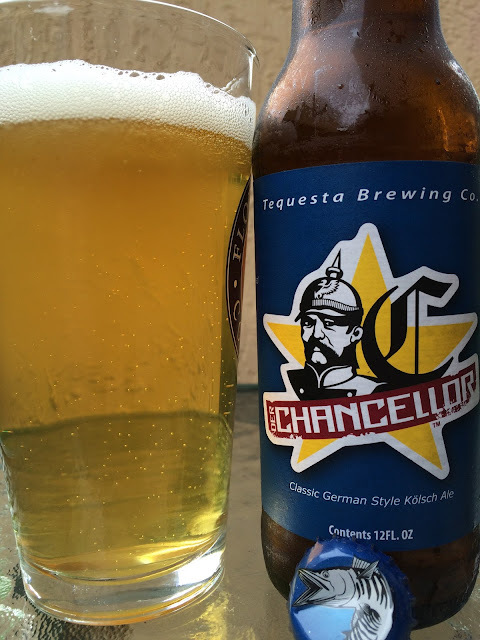 Today I'm checking out Der Chancellor, a German-Style Kolsch brewed by Tequesta Brewing in Tequesta, Florida (and contracted to Florida Beer Company, too, so they are able to brew enough to have it bottled and shipped to my county!) I've had this beer a few times before, at the brewery and a few events, but when I saw bottles on the local shelf, I decided to go for it! 5.3% alcohol. Bready, grainy, lightly sweet aroma. Very nice. Sweet grainy flavors come through first as well, Toast and honey meet a light grassy spiciness. Good body, perfectly balanced, nice flavors. I could easily drink this all day, and thanks to it being bottled, I can do just that!